On occasion I’ve contacted distant relatives when I find contact information for them. That’s been somewhat hit or miss. One big hit though was last month I contacted someone who turned out to be the cousin of Anne Klindt Falconer. Anne would be my second cousin once removed. That means she and my father shared great grandparents. My second great grandparents were Anton Weiss and Clara Voigt Weiss. After Anton died in 1911, Clara moved to California and lived with her daughter Celia. 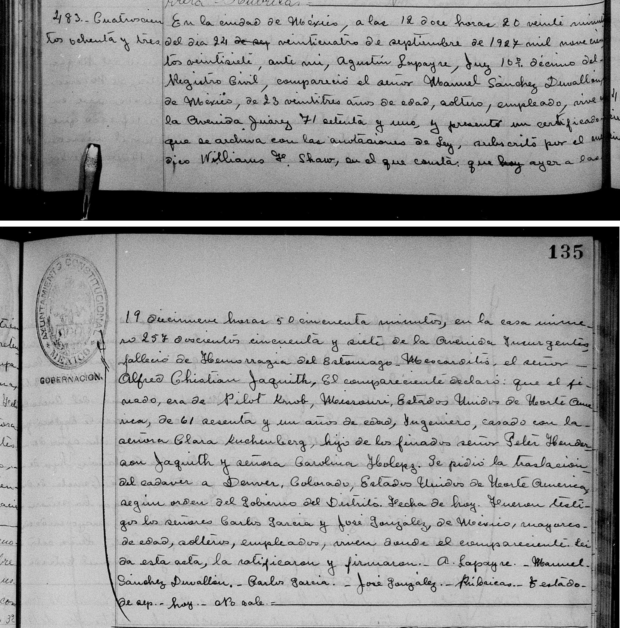 Clara’s photo album went into Celia’s hands when she died in 1915. Her daughter Agnes took the album after Celia died, and Agnes’ niece Anne took the album when Agnes passed away. In Regensberg, Bacaria, on February 27, 1827, Anton Weiss was born. And near Cologne, Germany, Clara Voigt first saw the light of day on May 2, 1833. 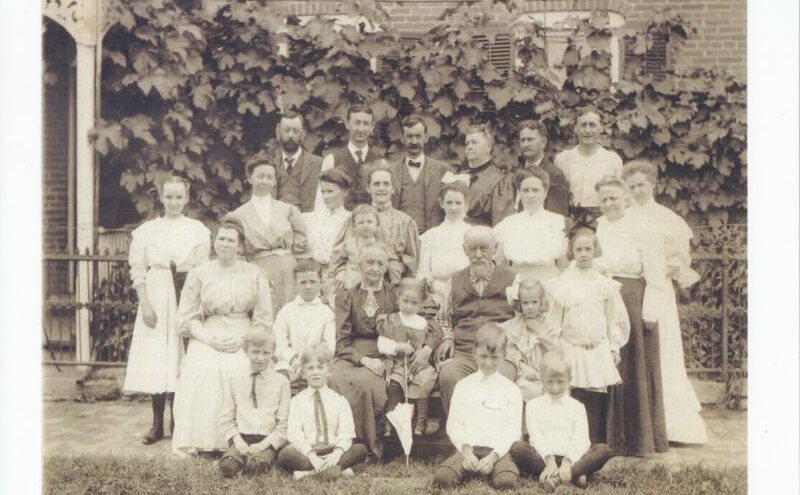 They both came to America in the same year, 1852, although they never met until within a few weeks of their marriage, Mr. Weiss spending some time in the east and was also in business in Dubuque before he came to Cassville in 1855 in company with Gustav Candler and William Schmitz. He formed a partnership with Mr. Schmitz and for seven years conducted the Cassville brewery and also a hardware store; when they dissolved Mr. Weiss retained the hardware business which he successfully conducted until he retired about fifteen years ago. Anton Weiss and Miss Clara Voigt were married by the late J.H.C. Sueclode, Esq., August 17, 1856, in the house now occupied by Thos. Williams, then owned by Jehn Berhardt Sr. (deceased), and standing on site of Mrs. Bernhardt’s present residence. In that house for a few months Mr. Weiss and his bride lived until their own home was ready, and since then their home has been continuously where they still reside although the building has been continuously enlarged and improved from time to time. TO bless the worthy couple were good sons and dutiful daughters and all now living, except the eldest daughter, were at the Golden Wedding last Friday. Robert was the first born, then Cecelia (now Mrs. Henry Klindt,) they reside at North Ontario, California. Frank of Pukwana S.D. ; Theodore J. of Madison, Wis.; Joseph P. of Merrill, Wisc. ; Mary died in June, 1898; Clarissa now Mrs. C.F. Troeller of Larrabee, Iowa; the youngest child, their daughter Agnes, died July 21, 1903. 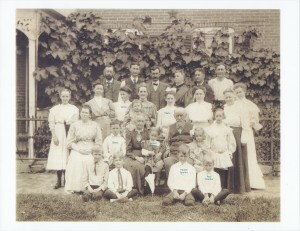 Other members of the family in attendance were Mr.s Frank Weiss and children, Marion, Theodore and Agnes; Mrs. J. P. Weiss and children Marie, Glenn and Archie; Harold, Paul and Agnes Troeller; Mrs. Barbara Freidmann of Chicago; and the Cassville relatives: Mrs. G. Kuchenberg, Miss Gertrude Josten, Mr. and Mrs. Joe Kuchenberg and children Hilda and Joe; Peter Voigt; Mr. and Mrs A.B. Teasdale and sons Charles and Harold. Mr. and Mrs Gustav Canderl, who for fifty years have been next-door neighbors, were at the wedding-dinner which was prepared by Mr. Weiss’ niece Mrs. Friedmann, one of whose many accomplishments is that she is a most skillful cook, and her offer to perform this labor of love was highly appreciated by the guests. A number of handsome gifts, leather coach, oak rocker and pieces of Haviland china and other tableware and mementos of the golden wedding anniversary of Mr. and Mrs. A. Weiss from their living family and friends. Anne identified the Troellers in the photo. Charles Teasdale’s son is still alive. 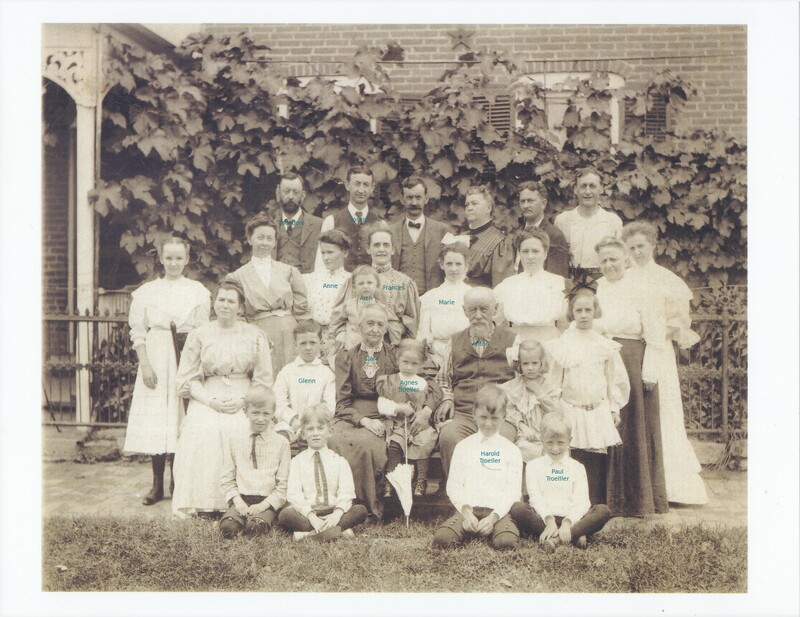 I found contact information for him online, and he responded when I requested his help identifying his family in the photo. I haven’t yet built the Kuchenberg part of my tree, so noone yet for me to contact regarding those identifications.